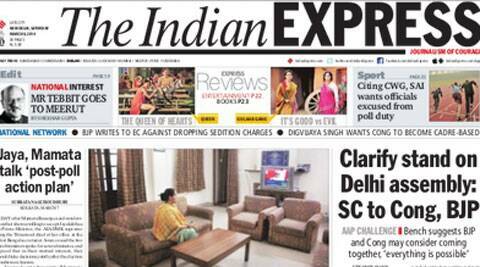 Five best Indian Express stories you must read before you begin your day. We bring you five best stories of the Indian Express you must read before you begin your day. 1. A wait so long: Lalu’s decision to give ticket to his daughter Misa Bharti has set him against one-time mentor Ram Kripal Yadav. Misa who went to meet Yadav on Friday was kept waiting at his residence but in vain. 2. Another Navy Mishap: A week after the INS Sindhuratna disaster, a Navy commander died and two personnel had to be hospitalised following an accident on board a Kolkata-class destroyer. 3. AAP and the protests: Police on Friday recorded the statements of over 15 eyewitnesses in a case registered against prominent AAP leaders over Wednesday’s violent protest. The FIR in the case was filed after clashes broke out between BJP and AAP supporters on Ashoka Road on Wednesday, leaving 28 people injured. 4. National Interest: Policemen in Meerut, less than 50 miles from Delhi, are so protective of the national interest that they threatened to charge 65 Kashmiri students with sedition for cheering Pakistan after it beat India in the Asia Cup. The patriots of Meerut obviously knew better than to let such an offence go unpunished. 5. Can Afridi make it? : Afridi is uncertain for Saturday’s final as he is carrying what team officials say is a grade one injury. He jarred the muscle during Pakistan’s last match against Bangladesh and was clearly limping when he was run out to a direct hit, attempting a sharp single.